The body of Jesus, having been executed by crucifixion, is being prepared for burial by some of his followers. Jesus's mother, the Virgin Mary, is usually shown wearing blue. She was with him at his death and burial. One of Jesus's female followers, perhaps Martha or her sister Mary, attempts to comfort Jesus's mother. For this work of art, the artist substituted a carved stone sarcophagus for the rough walls of a cave. Nicodemus assisted with the preparation and burial of Jesus's body. He is identified in earlier parts of the story as a member of the city assembly, and as attending one of Jesus's evening teaching sessions. Additional mourning men and women appear in the background, as if emerging from the darkness. St. Mary Magdalene, one of Jesus's earliest followers, would be one of the three women to discover Jesus's empty tomb the next morning, and first to encounter the resurrected Jesus. The very faint lines of a halo around Jesus's head signify his divine nature. 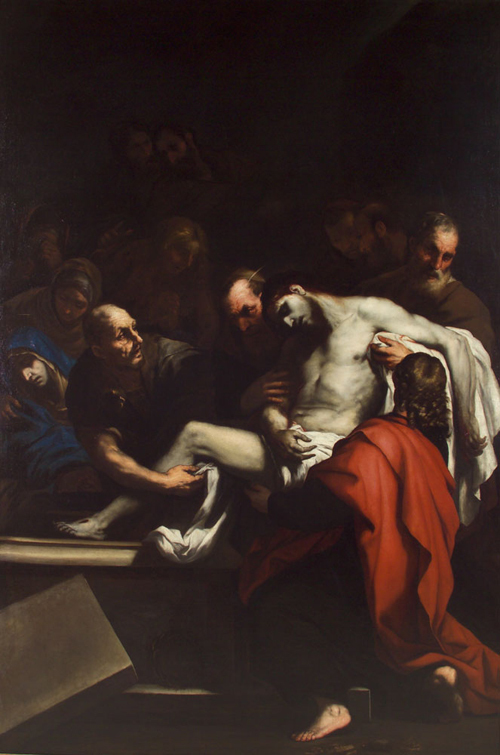 Joseph of Arimathea took charge of Jesus's body and donated his own tomb for Jesus's burial. St. John the Evangelist is often shown with a red cloak. He was one of Jesus's twelve Apostles, or first followers, and was also present at Jesus's death. He is believed to have written the Gospel of John, several letters now included in the New Testament, and the Book of Revelation.